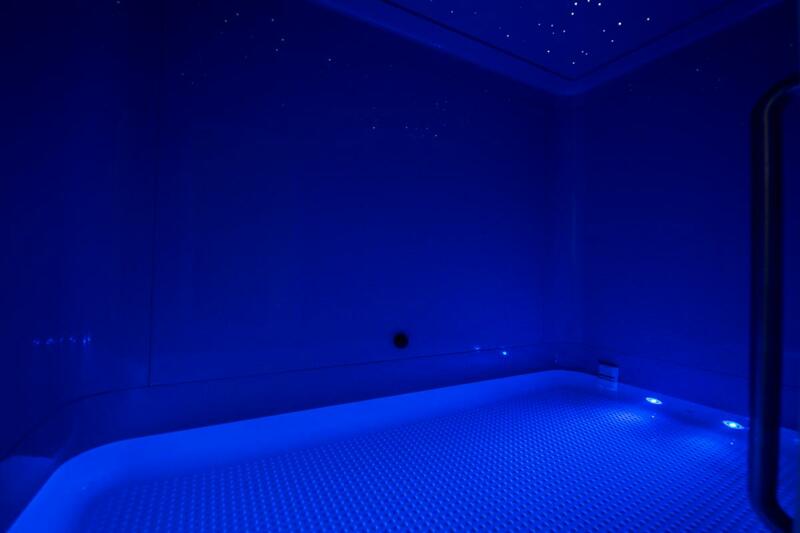 Floating will introduce you in very pleasure state and allow to rest your body and mind, the gravity also will not bother you. Every hour spend in our place is improvement of your well-being by endorphins release. It acts antidepressant, enhances concentration and creativity. One hour session can replace 4 hours of sleep. By regular visits you will regenerate your body and perfectly prepare for competition. During the session we stimulate the body natural ability to cure and regeneration, it will let you completely forget about pain. In professional floating cabin you will completely get rid of stress. Through stimulus elimination you will be able to totally calm down and improve your self-confidence. It is therapy which consist of eliminating about 90% of outer stimulus. Thanks to high concentrated EPSOM salt solution we can’t feel the earth gravity. The session starts by entering a cabin with music in the background which helps us to get relaxed. By this our muscles losses stress, endorphins starts to eject and cortisol is being reduced. After only 3 hours sessions our body get used to new environment and we can feel effects coming from the therapy: stress effects reduction, muscles relax, concentration and memory improvement, relief of spine and rheumatic pain, blood high pressure reduction, positive, soothing impact on skin, sleep quality improvement, brain hemispheres synchronization, physical and mental pain reduction, slimming support, injuries treatment speed up, better work of immune system. Interesting fact: Milan Lab – laboratory of football club A.C. Milan uses floating cabins to sport preparations, biological renovation and to help players recover from injuries. 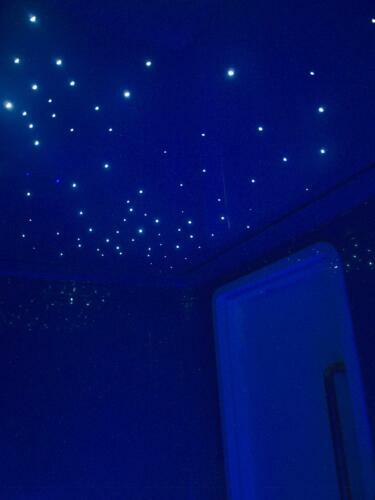 It’s spacious, soundproof room, filled with around 25 cm of salted water, in which is dissolved 370 kg Epsom salt. This solution is constantly heated up to close to body temperature, around 35° C. Person located inside is totally isolated from the outside world. It allow to experience a state of deep relax both physical and mental. Thanks to high concentrated Epsom salt solution, human body floats freely on the water. We don’t feel body weight, but experience fascinating levitiation feeling instead. Due to its dimensions (2,4 m length, 1,4 m width and 2,2 m height) cabin provides session members roominess comfort also. Our floating cabin is placed in a special room carefully designed with the smallest details. To construct cabin the most effective thermal and acoustic isolating materials had been used. Those materials placed between all surfaces of cabin, create warm and quiet relaxing environment. Water inside the cabin is filtered four times between sessions by a high efficient pump. Every client that comes inside can be sure that the water is clean and absolutely sterile. Heating in cabin provide warmth that is close to body temperature, dosing delicate heat to water if needed. Thanks to that temperature of the water is very stable and even by long using of the cabin there is no loss of warmth. Music inside sounds with crystal-clear sound quality speakers placed above and below floating on water client. 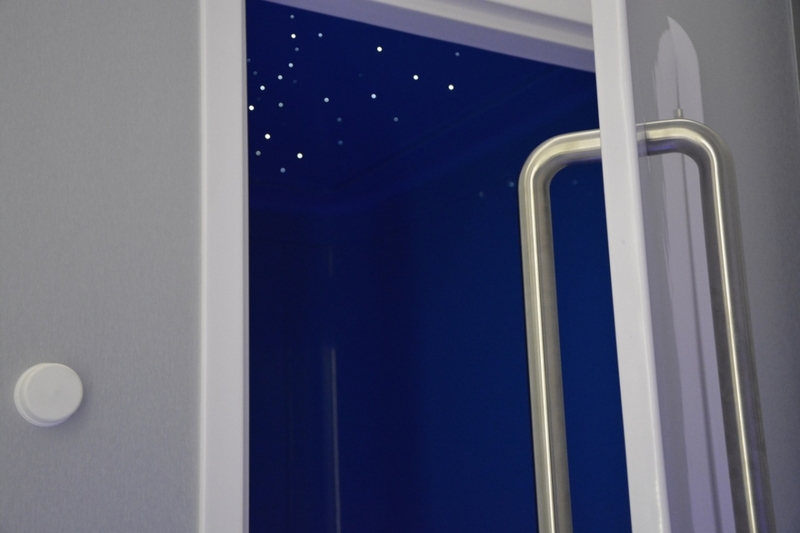 Tempting inside of the cabin is illuminated with underwater LED diodes in deep, intensive blue color. Big, tippable door simplify using the cabin by less physical efficient people, and conveniently placed inside handle provides greater comfort and sense of security. It’s worth to take a slippers and towel. Other necessary accessories you will find at the place (shampoo, shower gel, hair dryer). 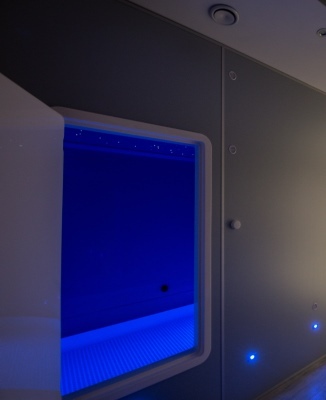 We recommend to come 15 minutes before session and find out more about the benefits from floating. Being here in the room with cabin take a shower and if you have small wounds lubricate them with provided Vaseline. Put in ear plugs which you will get from us before entering the cabin and lay down comfortably on the water. Everything depends only on you, you can relax either with “starry heaven” or in darkness, in silence or with music, in closed cabin or with open door. 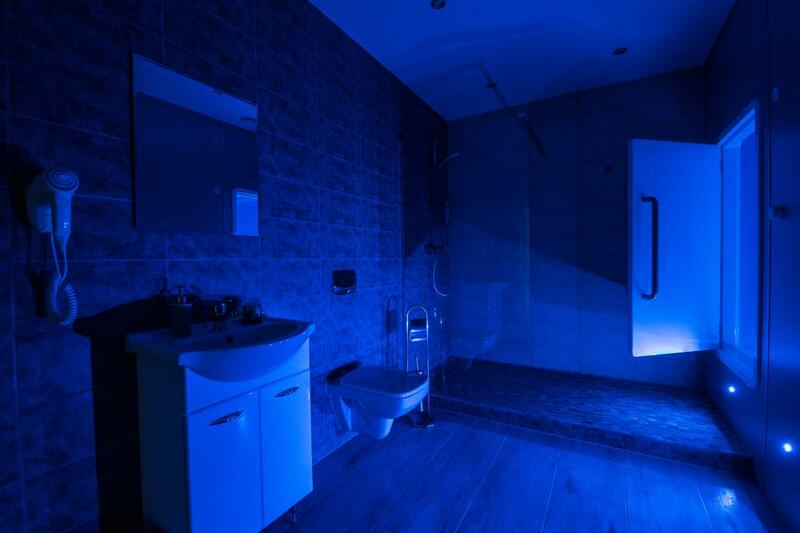 Bathroom, in which cabin is placed, is all for you and you are the only person in there through the whole session. It’s not recommended to shave the day before because of high salinity of water. You shouldn’t also drink energy drinks, including coffee, before session. We do not recommend using floating during menstruation. During session your phone should be switched off or muted without vibration. It’s commonly known that relaxing dream is essential for our health and it’s often the best way to get rid of stress. Our organism has unusual regeneration power, we just have to let ourselves to be relaxed so that power can work. Floating person reaches theta state quite fast, not falling asleep. By this we improve our creativity, peace of mind feeling, unity and harmony with earth. It’s mysterious and hard to hold state but even after leaving cabin theta waves generation is still continuing through next weeks. Unfortunately nowadays stress is sometimes a dominating state. In our organism we have increased amount of cortisol and testosterone which we need for action but not in the long term in everyday life. Stress is all around us, excess of cortisol accumulates and we don’t do nothing with it, our immune and digestive system capabilities are decreasing, we sleep bad hence we are susceptible to all sort of civilization diseases. We know how to help you that’s why we decided to offer you a session in our floating cabin which will help you to restore your psychophysical balance. Thanks to session your brain becomes more creative and your awareness is growing. Following that the concentration is immediately increasing as well as memory and brightness of mind. In these conditions brain tends to balance and harmony of both hemispheres – we increase activity of right – emotional hemisphere and session allows us to fit to sleeping capabilities, imagination, visualization and problem solving with way that has not been available earlier. We learn more easier and we are free from negative beliefs and schematics. Fatigue is decreasing and symptoms of depression, neurosis and addiction are eliminated. Elimination of external stimulus, that’s what floating gives us. In cabin every physical experience is strengthened, we are able to relax and concentrate on almost every single body part. 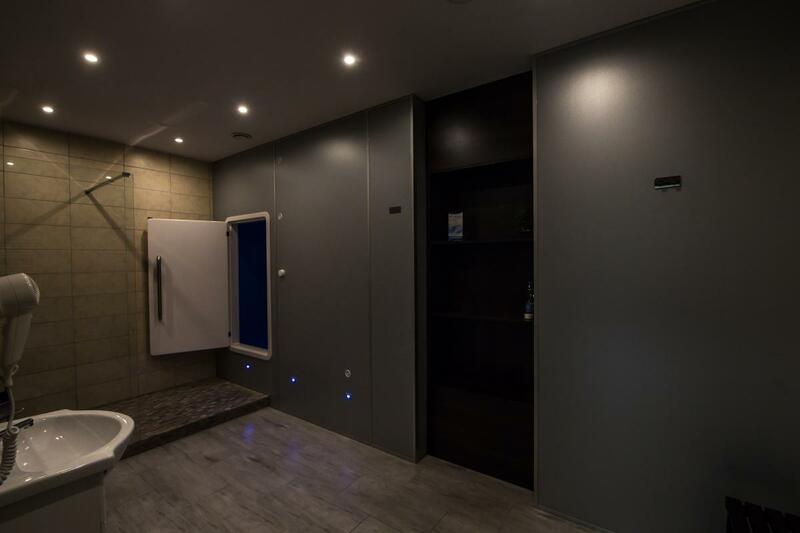 Moreover systematic sessions in our cabin soften and, with time, eliminate different kind of back and muscle pains, joints and tendons inflammations or even injuries and contusions. Significantly reduces symptoms of chronic pain, for example migraine. Speeds up rehabilitation and convalescence, reduces high blood pressure by slowing pulse. Improvement of sports results by increase of efficiency and physical fitness hence general increase of organism energy. Cleanse body from toxins, improves metabolism which highly helps in slimming process. Supports prevention and treatment of many diseases and positively affects hair and skin (for example acne and cellulite). Very important for properly functioning organism is to be able to, just for a while, fully rest and break away from everything what is around us, in a busy and nervous day. To obtain new ideas you need to have a space in which your mind chatter and opinions about who you are and what you do are rejected. Then you can contact with deeper part of you which show you unusual solutions. Floating cabin is helpful for everyone with active lifestyle. Reservoir allows to get relaxed in a few minutes and one session is comparable to 4 hour of sleep. Session in cabin after all day of work gives huge relief. Muscles tension related with relentless fight with gravity suddenly disappears and we realize that lot for tiredness accumulated during all day is caused by keeping body in vertical position. In neurophysiological point of view, of constant calculations necessity (of gravity direction, temperature changes etc.) huge masses of neurons are released. Not only that we rest but we also save lot of energy that we use in every second of our life. Sensory deprivation reservoir is especially beneficial for those who suffers chronic pains, illnesses or insomnia due their work and being overloaded by it. For whom float session is? struggling with backaches, migraine etc. What should I take for float session? Slipper and towel are enough. Swimsuit isn’t required (unless you want to show off to you friends I make a selfie inside the cabin than go ahead) because room with cabin and bathroom is locked and it’s only for you. Everyone who wants to float can be sure that water inside the cabin is completely sterile and clean. High concentration of EPSOM salt and fourfold water filtering system by a high efficient pump gives us guarantee of hygiene at highest level. How many people can enter cabin at once? One person, you cannot float in pair or in group. Either in cabin and in bathroom can stay only one person, exception is floating child or disabled person, then also guardian can stay in bathroom. Do I have to be afraid of claustrophobia? Of course not. Interior of cabin with dimensions of 2,4 m long, 1,4 m width and 2,2 m height gives full comfort of roominess. Besides everything is under our control, we can open cabin door or control the light anytime. Any swimming skill are unnecessary here. Water in cabin reaches just 25 cm deep and high concentration of EPSOM salt makes our body float on the surface and it doesn’t touch the bottom. What if I fall asleep in cabin? No worries, it’s completely safe. Floating is characterized by casing deep relax state while which we often falls asleep. How long lasts the standard session? 60 minutes of floating in cabin. For every activities before and after session like shower, drying and dress up you have about 90 minutes. 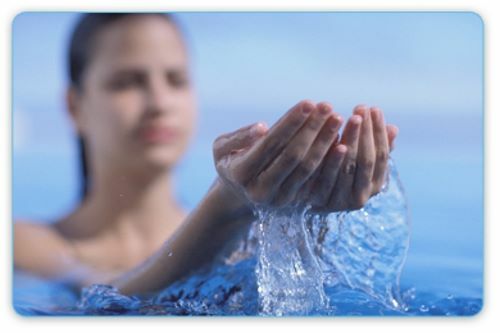 Additionally there is possibility to have longer session for experienced floaters. What if I would want to try just once? We assure you that it will be hard. If you find benefits coming out from floating then you will come back for sure. 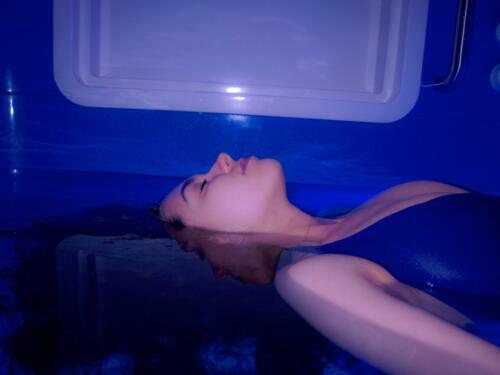 But of course you always have to familiarize with new situation thus probably after just one session you won’t be able to feel all the benefits from this therapy, however every next session will let you scoop more of benefits from floating. What is time limit of floating? There is now time limit, you can float as often as you want. However we remind that effect from one session stays for few days so to satisfy needs it’s enough to have one or two session in week. Will my skin be wrinkled after session? No, water in capsule contains high concentrated salt solution, thanks to which minerals are not washed out from our body. Used in solution EPSOM salt is natural pure mineral compound of magnesium sulfate which makes our skin soft and silky. Moreover solution is odorless and it’s pH is neutral for skin. What if I dye my hair in recent days? We recommend a week break between treatment and session because color might fade and dye water in cabin. Before enter the cabin you have to wash off your makeup also. Can I use floating during pregnancy? Of course, unless your doctor would have some contraindications. By floating on the water you can also relieve your spine and ponds. However we don’t recommend use floating in first trimester of pregnancy. Can I be naked or do I have to wear swimsuit in cabin? Naked bath is the most advantageous because our brain will not have to receive unnecessary stimulus from pressure of suit. Don’t put swim cap as well because it will just disturb and additionally you will deprive you hair benefits from EPSOM salt. Can I call staff when something disturb me during session? Of course. There is a red button inside the cabin by which you can call the staff immediately. Yes, but only under adult person guard. What if I have chronic skin disease? If you don’t have open wounds on your body and your actual skin condition is good than we welcome. Why I have never heard of floating before? 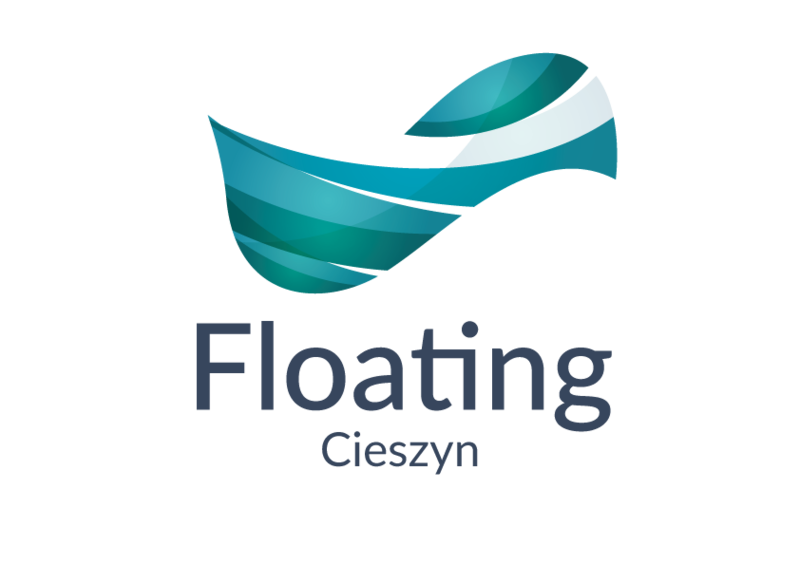 Floating just reaches Poland but it develops fast thanks to its advantages, including relax and calm possibility as well as giving new exceptional experiences. There are over 700 floating resort in the world and this number still grows. from 13 to 24.03.2019Second person in the same day FREE!